Four years after Etrian Odyssey IV: Legends of the Titan and two remakes later, Atlus brings back a new sequel for their beloved Dungeon-Crawler series. Now more than year after its Japanese release, the West finally gets Etrian Odyssey V: Beyond the Myth on Nintendo 3DS, full of dungeons to explore and another layer of Yggdrasil to venture in. This time, Etrian Odyssey V takes us on Arcania, where legends tell that anyone who reaches the top of the Yggdrasil tree will see his wish come true. Each of the races that populate these lands have their own interpretation of the myth but the objective does not vary far: climb floor by floor the various labyrinths that is basically your main adventure, deprived this time of a world map to go. The game proposes four races which, at the base, have their own specific classes, counting in total of 10 different ones. It will be necessary for example to choose a “Earthlain” (the equivalent of the humans) to have a warrior or a tank, or take a “Celestrian” for a mage or necromancer. This choice of class and race will then determine the character’s skill tree. If your class’s abilities mostly take the form of new attacks, heals, or buffs, your race’s skills usually matches talents, non-combat abilities, and Union Skills, but we’ll come back to that later. It will therefore be imperative to build a balanced team, by taking in consideration these different skills and their evolution. Subsequently, you will have access to subclasses as well as new abilities and can even assign to your characters classes from other races. This gives access, past a certain stage of the game, to a wide range of personalization for your guild. Because yes, it is possible to create up to 30 characters and then train different squads depending on your playstyle. Once your guild is created, you are sent straight away into the endless climb of the world tree as a first dungeon. The Yggdrasil is divided into several layers which themselves are divided into several stages. Armed with your stylus, you’ll have to meticulously map the surroundings on the touch screen: walls, doors, switches, and other shortcuts. Carefully creating your own map is a necessity to properly understand the dungeons, and thankfully, the mapping system makes it a real pleasure to explore very large labyrinths. Especially since they are full with events, chests and materials to loot. You will soon after acquire non-combat skills such as fishing, mining or harvesting to obtain the necessary elements for the creation of new weapons and objects on top of dungeon loot. When it comes to the combat, Etrian Odyssey V: Beyond the Myth follows the same classic turn-based system, where you can choose different actions for each characters, and see them be executed during the combat phase. The game adds this time Union Skills, a reference to previous game’s Burst and Limits Skills, which can be used at the same time as a classic command (attack, defend, skills). Each of them, with a full gauge, will involve a number of characters from the battle to perform either a high powered attack, buffs or heals. In addition to exploration and classic fighting, we will get to battle FOEs, which are very tough enemies moving on the map as you advance from tile to tile on the map. The movements of these minibosses vary according to their type, ranging from moving only one tile where others can jump several at once but only in predefined directions. Others will come directly to your pursuit while some, the scorpions for example, will have to see you before moving around. This system of movement of FOEs will add a certain extra riddle, more or less arduous, as to how to advance and smartly on the app without getting caught. It is only after having gained in enough levels that direct confrontation will be possible, but the stakes are worth it, as they will drop rare materials needed to create and improve your equipment, in comparison to what a classic herd of critters can give you. Etrian Odyssey V is a relatively difficult game, even in basic mode. You will learn how to manage your round trips to Iorys, a city acting as main Hub where are gathered merchants, inn and the council which gives you main quests. If the back and forth are a component of the genre that is a typical Dungeon-Crawler, the farming part is especially pronounced in this series, especially if you hope to defeat the bosses and other FOEs. It will be necessary to grind through some experience boost and collect more materials that will sell for money, so that you can unlock new equipment from the merchant. In addition to all the features that are mostly returning from previous games, Etrian Odyssey V: Beyond the Myth is not stingy with new content. Whether through hidden events in labyrinths or quests that can be activated at the tavern, the game happily gives you good reasons to farm and learn a little more about his universe. All this offers a very good lifespan in addition to satisfying the completionist. Finally, if graphically, the evolution is almost invisible compared to the last episodes and that the settings are always simplistic, that does not prevent the game to be quite rich, full of colorful environments topped by a great soundtrack. Etrian Odyssey V: Beyond the Myth was reviewed using a Nintendo 3DS downloadable code of the full game provided by Atlus. We don’t discuss review scores with publishers or developers prior to the review being published. Etrian Odyssey V: Beyond the Myth is a typical continuation of the series, focusing on what it does best, from dungeons to exploration and of course the combat. The very rich mapping system and the secrets that fill the dungeons make the whole thing quite addictive, urging you to explore and find every nook and cranny. With its very complete class system, the game offers a wide panel in terms of customization and evolution, and will appeal to turn-based RPGs fans. 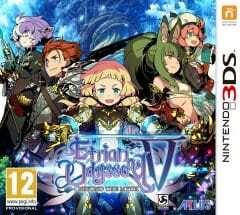 However, I'm rather shocked that a clear storyline isn't present and that the execution of the game is just too simplistic with no drastic changes since the previous opus, but this doesn't prevent Etrian Odyssey V from being a solid adventure and great Dungeon-Crawler.